One of the everyday moments that I wish would last forever, but realistically know it won’t is Aro saying ‘Night night Mummy’. 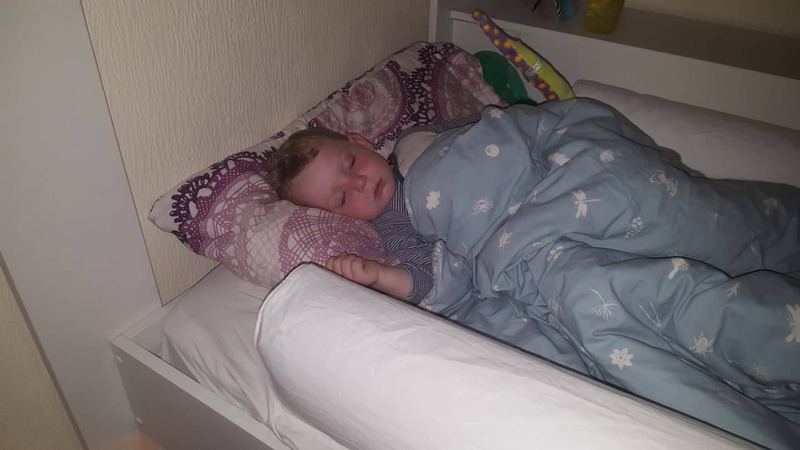 It began months ago when he started speaking, back when we were going in every hour or so to resettle him the evenings, and after a little wriggle he’d settle down again and mutter ‘Nunight Mummy’ as he drifted off again. Now he wakes up a lot less often during the night and sometimes not at all, but on the times he does I still get the little sleepy voice muttering at me before I leave his room again. I really don’t want him to ever stop doing it, although I know his voice will change soon and become a proper little boy voice rather, and then down the line, his voice will break and become a man! But for now, I savour every little ‘n’night mummy’! Next Post EZPZ Mats for weaning fun and craft sorting! I adore looking back and hearing what their voices sounded like as you never really notice the change do you? Long may the night nights continue. Aww but he’s a boy. He will do this for years to come. My 10 year old is still adorable and huggable most of the time with me. And even my 28 year old nephew will still cuddle his mum!